I’ve been waiting since last year to hear the happy News that she’s carried this promise out! Sally Jones, who left the UK to join the extremist group of ISIS, has threatened to blow herself up after her husband was killed in a drone strike in Syria’s Raqqa. Jones, 47, is a former punk rocker, originally from Kent. 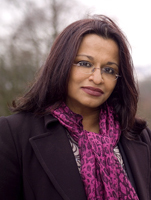 She has converted to Islam and has been radicalized recently through direct contact with terrorist groups online. Quoting a Muslim extremist woman who killed herself along with scores of Russian soldiers in a truck bombing in 2000, Jones has expressed herself on the social media that she could be about to become a “black widow” suicide bomber. The term “Black Widows” refers to a group of Chechen Muslim women whose husbands were killed by the Russian forces in Chechnya. She moved to Syria with her 10-year-old son in 2013 and joined ISIS after being brainwashed. Source: The Crusades – Christians vs Muslims – What”s it all about? Millions of Muslims worldwide are now marking the holy day of Ashura, the tenth day of Muharram in the Islamic calendar. This year, Ashura falls on Nov. 3-4. The Islamic holy day is a voluntary day of fasting that marks the day Noah left the Ark, the time when the Israelites were freed from slavery in Egypt, and the death of Imam Hussein, grandson of Prophet Muhammad. Sunni and Shiite Muslims – the two major branches of Islam – mark the day in separate ways. For Sunnis, Ashura is considered a day of atonement. Some choose to fast for two days, as the Prophet Muhammad did when he observed Jews doing the same for their Day of Atonement. For Shiite Muslims, Ashura also commemorates the martyrdom of Hussein, grandson of the Prophet Muhammad, in the year 680 at Karbala in modern-day Iraq. This year, the holy day has taken on new meaning since the Islamic State group, or ISIS, has overrun large parts of Syria and Iraq. Members of the Sunni jihadist group consider all Shiites heretics, and engaged in a campaign of massacres against them. Multiple attacks aimed at Shiites killed more than 40 people in Baghdad two days before Ashura started, Agence France-Presse reports. The word “Ashura” means “tenth” in Arabic, since the holiday falls on the tenth day of Muharram, the first month in the Islamic calendar. Sunni Muslims consider Ashura a day to fast. They see the day as a way to memorialize Allah’s role in saving Moses and the Israelites from the Egyptian pharaoh. Fasting is meant to symbolize Allah’s omnipotence and benevolence. Many Sunni Muslims choose not to participate in overt displays of happiness such as weddings to focus on fasting. For Shiite Muslims, Ashura is all about the martyrdom of Imam Hussein. In Islamic history, the grandson of the Prophet Muhammad stood up to a tyrant from the Ummayad dynasty, Yazid, in a battle that cost him his life, known as the Battle of Karbala, in 680. Hussein and his small army was massacred by an army sent by Yazid, a ruler whom Shiites consider a usurper of the caliphate, which belongs in their view to the line of Ali, Hussein’s father. Hussein’s death along with that of his father Ali (the son-in-law of the Prophet and the fourth caliph, who was murdered in 661) gave rise to the great schism in Islam between its two main sects: Sunnis and Shiites. This sectarian strife has continued until today, where public Ashura demonstrations have become targets of violence. In 2005, nearly a thousand Shia pilgrims died in a stampede on a Baghdad bridge after a rumor spread that a suicide bomber was in the crowd. 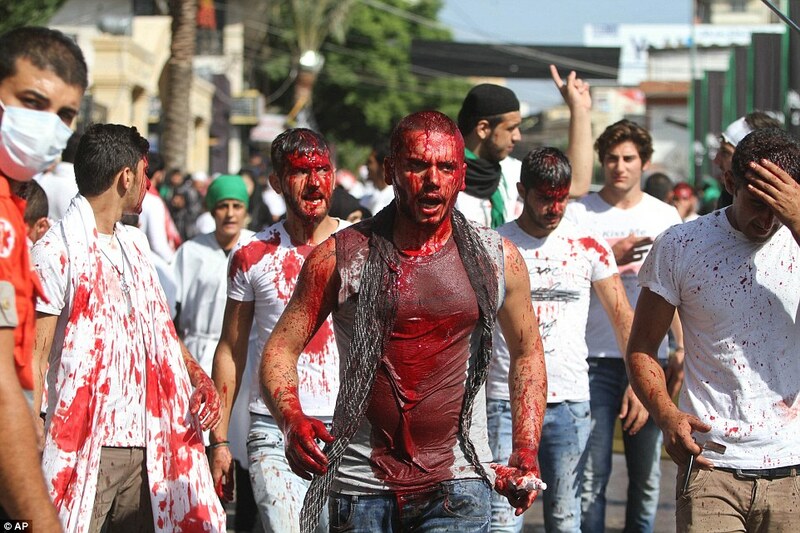 In 2013, at least 36 Shia pilgrims were killed in Iraq during Ashura demonstrations. This year, Iraq’s Shiite-led authorities sent more than 30,000 troops to Karbala. 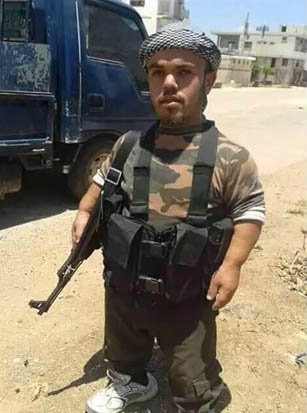 No attacks were reported. On Ashura, Shiite men and women dress in black, slap their chests and chant. Others reenact the Battle of Karbala with mourning rituals. Known as passion plays, the performances include a mourning procession and speeches. Many make a pilgrimage on Ashura to the Mashhad al-Husayn, the shrine in Karbala that is regarded as Hussein’s tomb. 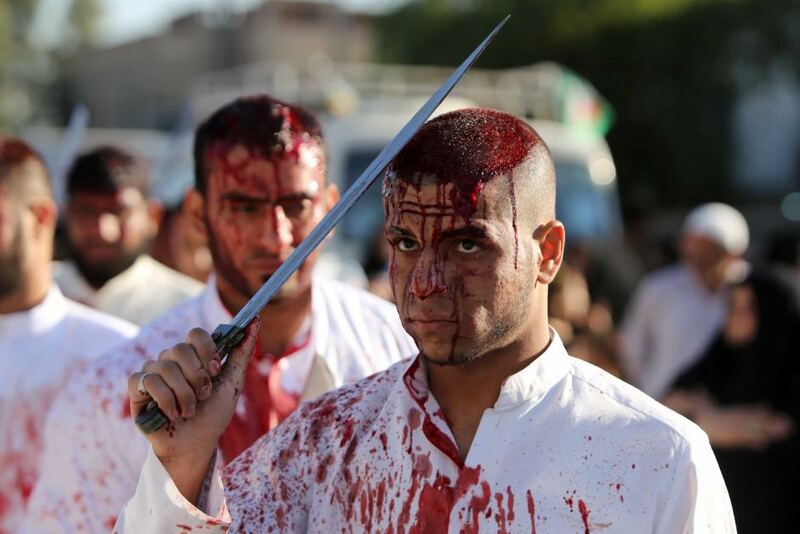 Some Shiite men flagellate themselves with chains and cut themselves with knives on their foreheads as a way to mourn for Hussein in a ritual called “tatbeer.” Hundreds were seen on the streets of Karbala on Tuesday performing the ritual. Some Shiite clerics have condemned the practice and have advocated for donating blood instead. The Day of Ashura (Arabic: عاشوراء‎ ʻĀshūrā’, colloquially: /ʕa(ː)ˈʃuːra/; Urdu: عاشورا‎; Persian: عاشورا‎‎ /ʕɒːʃuːˈɾɒ/; Azerbaijani: Aşura Günü or English: Day of Remembrance) is on the tenth day of Muharram in the Islamic calendar and marks the climax of the Remembrance of Muharram. Shiite commemorations of the Day of Ashura have traditionally included rituals which have been condemned by many Shia religious authorities recently under the claim that such practices are wrong or unislamic. This day is celebrated by Sunni Muslims (who refer to it as The Day of Atonement) as the day on which the Israelites were freed from the Pharaoh (called ‘Firaun’ in Arabic) of Egypt. However, Shi’a Muslims reject these stories and maintain that Ashura is a day of great sorrow due to the tragic events of Karbala. It is commemorated by Shi’a Muslims as a day of mourning for the martyrdom of Husayn ibn Ali, the grandson of Muhammad at the Battle of Karbala on 10 Muharram in the year 61 AH ( in AHt: October 10, 680 CE). The massacre of Husayn with a small group of his companions and family members had great impact on the religious conscience of Muslims. Especially Shia Muslims have ever remembered it with sorrow and passion. Mourning for Husayn and his companions began almost immediately after the Battle of Karbala, by his survivor relatives and supporters. Popular elegies were made by poets to commemorate Battle of Karbala during Umayyads and Abbasids era. The earliest public mourning rituals happened in 963 CE during Buyid dynasty. Nowadays, in some countries such as Afghanistan, Iran, Iraq, Lebanon, Bahrain, and Pakistan, the Commemoration of Husayn ibn Ali has become a national holiday and most ethnic and religious communities participate in it. In secular country like India, Ashura (10th day in the month of Muharram) is commemorated and is a public holiday due to the presence of a significant Indian Shia Muslim population (2-3% of total population, 20-25% of Indian Muslim population). The root of the word Ashura has the meaning of tenth in Semitic languages; hence the name of the remembrance, literally translated, means “the tenth day”. According to the orientalist A.J. Wensinck, the name is derived from the Hebrew ʿāsōr, with the Aramaic determinative ending. The day is indeed the tenth day of the month, although some Islamic scholars offer up different etymologies. In his book Ghuniyatut Talibin, Sheikh Abdul Qadir Jilani writes that Islamic scholars differ as to why this day is known as Ashura, some of them suggesting that this day is the tenth most important day with which God has blessed Muslims. In April 680, Yazid I succeeded his father Muawiyah as the new caliph. Yazid immediately instructed the governor of Medina to compel Hussayn and few other prominent figures to pledge their allegiance (Bay’ah). Husain, however, refrained from it believing that Yazid was openly going against the teachings of Islam in public and changing the sunnah of Muhammad. He, therefore, accompanied by his household, his sons, brothers, and the sons of Hasan left Medina to seek asylum in Mecca. On the other hand, the people in Kufa who were informed about Muawiyah ‘s death, sent letters urging Husayn to join them and pledge to support him against Umayyads. Husayn wrote back to them saying that he would send his cousin Muslim ibn Aqeel to report to him on the situation. 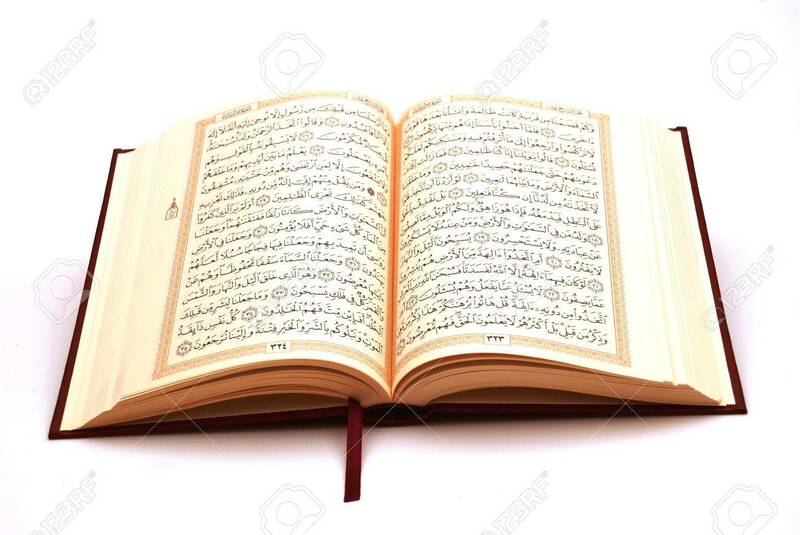 If he found them united as their letters indicated he would speedily join them, because Imam should act in accordance with the Quran, uphold justice, proclaim the truth, and dedicate himself to the cause of God. The mission of Moslem was initially successful and according to reports 18,000 men pledged their allegiance. But situation changed radically when Yazid appointed Ubayd Allah ibn Ziyad as the new governor of Kufah, ordering him to deal severely with Ibn Aqeel. Before news of the adverse turn of events arrived in Mecca, Husayn set out for Kufa. On the way, Husayn found that his messenger, Muslim ibn Aqeel, was killed in Kufa. He broke the news to his supporters and informed them that people had deserted him. Then, he encouraged anyone who so wished, to leave freely without guilt. Most of those who had joined him at various stages on the way from Mecca now left him. Later, Husayn encountered with the army of Ubaydullah ibn Ziyad in his path towards Kufa. Husayn addressed the Kufans army, reminding them that they had invited him to come because they were without an Imam. He told them that he intended to proceed to Kufa with their support, but if they were now opposed to his coming, he would return to where he had come from. However, the army urged him to choose another way. Thus, he turned to left and reached Karbala, where the army forced him not to go further and stop at a location that was without water. Umar ibn Sa’ad, the head of Kufan army, sent a messenger to Husayn to inquire about the purpose of his coming to Iraq. Husayn answered again that he had responded to the invitation of the people of Kufa but was ready to leave if they now disliked his presence. When Umar ibn Sa’ad, the head of Kufan army, reported it back to Ubaydullah ibn Ziyad, the governor instructed him to offer Ḥusayn and his supporters the opportunity to swear allegiance to Yazid. He also ordered Umar ibn Sa’ad to cut off Husayn and his followers from access to the water of the Euphrates. Name of the Karbala Martyr Husayn with Islamic calligraphy in Hagia Sophia Mosque. On the next morning, as ʿOmar b. Saʿd arranged the Kufan army in battle order, Al-Hurr ibn Yazid al Tamimi challenged him and went over to Ḥusayn. He vainly addressed the Kufans, rebuking them for their treachery to the grandson of Muhammad and was killed in the battle. The Battle of Karbala lasted from morning till sunset of October 10, 680 (Muharram 10, 61 AH) all Husayn’s small group of companions and family members (in total who were around 72 men and few ladies and children)[a] fought with a large army under the command of Umar ibn Sa’ad. 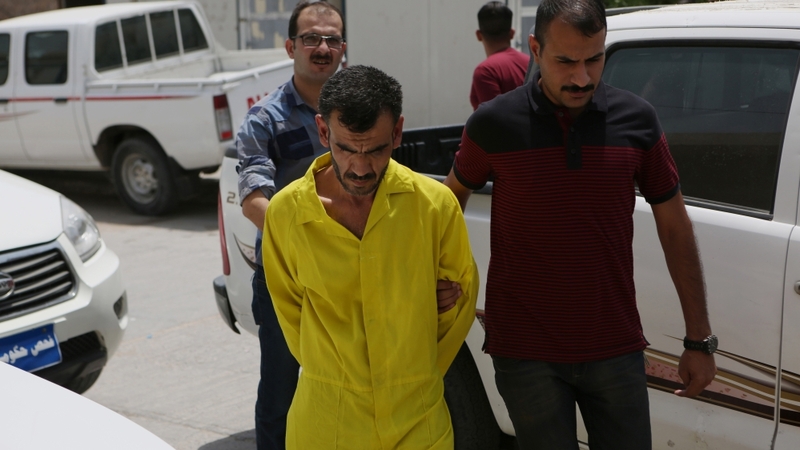 and were killed near the river (Euphrates) where they were not allowed to get any water from. 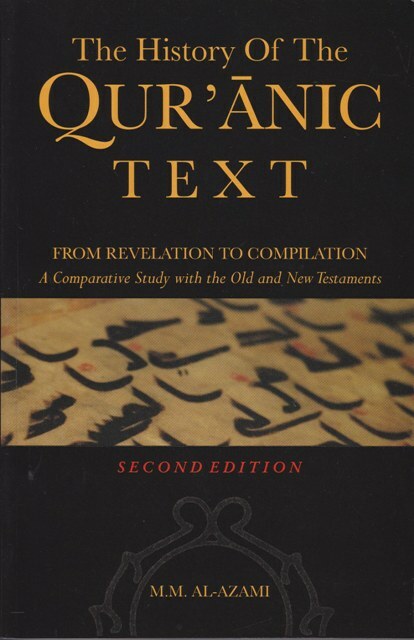 The renowned historian Abū Rayḥān al-Bīrūnī states; “… then fire was set to their camp and the bodies were trampled by the hoofs of the horses; nobody in the history of the human kind has seen such atrocities.” Before being killed, Husayn said “If the religion of Muhammad was not going to live on except with me dead, let the swords tear me to pieces.”[unreliable source?] Once the Umayyad troops had mass murdered Husayn and his male followers, they looted the tents, stripped the women of their jewelry, and took the skin upon which Zain al-Abidin was prostrate. It is said that Shemr was about to kill him but Husayn’s sister Zaynab was able to make Umar ibn Sa’ad, the Umayyad commander to let him alive. 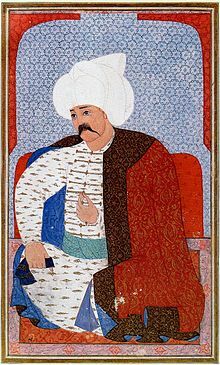 He was taken along with the enslaved women to the caliph in Damascus, and eventually he was allowed to return to Medina. The tragedy of Karbala decided not only the fate of the caliphate, but of the Mohammedan kingdoms long after the Caliphate had waned and disappeared. Millions of Shia Muslims gather around the Husayn Mosque in Karbala after making the Pilgrimage on foot during Arba’een, which is a Shia religious observation that occurs 40 days after the Day of Ashura. According to Ignác Goldziher ever since the black day of Karbala, the history of this family … has been a continuous series of sufferings and persecutions. These are narrated in poetry and prose, in a richly cultivated literature of martyrologies …’More touching than the tears of the Shi’is’ has even become an Arabic proverb. The first assembly (majlis) of Commemoration of Husayn ibn Ali, it is said to have been held by Zaynab in prison. In Damascus, too, she is reported to have delivered a poignant oration. The prison sentence ended when Husayn’s 3 year old daughter, Rukaya, died in captivity. She would often cry in prison to be allowed to see her father. She is believed to have died when she saw her father’s mutilated head. Her death caused an uproar in the city, and Yazid, fearful of a potential resulting revolution, freed the captives. Husayn’s grave became a pilgrimage site among Shiite only a few years after his death. A tradition of pilgrimage to the Imam Husayn Shrine and the other Karbala martyrs quickly developed, which is known as Ziarat ashura. The Umayyad and Abbasid caliphs tried to prevent construction of the shrines and discouraged pilgrimage to the sites. The tomb and its annexes were destroyed by the Abbasid caliph Al-Mutawakkil in 850–851 and Shi’a pilgrimage was prohibited, but shrines in Karbala and Najaf were built by the Buwayhid emir ‘Adud al-Daula in 979-80. Public rites of remembrance for Husayn’s martyrdom developed from the early pilgrimages. Under the Buyid dynasty, Mu’izz ad-Dawla officiated at public commemoration of Ashura in Baghdad. These commemorations were also encouraged in Egypt by the Fatimid caliph al-‘Aziz. From Seljuq times, Ashura rituals began to attract participants from a variety of backgrounds, including Sunnis. With the recognition of Twelvers as the official religion by the Safavids, Mourning of Muharram extended throughout the first ten days of Muharram. 10th of the month of Muharrem: The Ashure Day – Huseyn bin Ali was murdered at Kerbela  Remembrance by Jafaris, Qizilbash Alevi–Turks and Bektashis together in Ottoman Empire. This day is of particular significance to Twelver Shi’a and Alawites, who consider Husayn (the grandson of Muhammad) Ahl al-Bayt the third Imam to be the rightful successor of Muhammad. Shi’a devotees congregate outside the Sydney Opera House, Australia to commemorate Husayn. Shi’as make pilgrimages on Ashura, as they do forty days later on Arba’een, to the Mashhad al-Husayn, the shrine in Karbala, Iraq that is traditionally held to be Husayn’s tomb. On this day Shi’a are in remembrance, and mourning attire is worn. They refrain from music, since Arabic culture generally considers music impolite during death rituals. It is a time for sorrow and respect of the person’s passing, and it is also a time for self-reflection, when one commits oneself to the mourning of the Husayn completely. Weddings and parties are also not planned on this date by Shi’as. Shi’as also express mourning by crying and listening to recollections about the tragedy and sermons on how Husayn and his family were martyred. This is intended to connect them with Husayn’s suffering and martyrdom, and the sacrifices he made to keep Islam alive. Husayn’s martyrdom is widely interpreted by Shi’a as a symbol of the struggle against injustice, tyranny, and oppression. Shi’as believe the Battle of Karbala was between the forces of good and evil with Husayn representing good while Yazid represented evil. Shi’as also believe the Battle of Karbala was fought to keep the Muslim religion untainted of any corruptions and they believed the path that Yazid was directing Islam was definitely for his own personal greed. Shia Imams strongly insist that the day of Ashura should not be taken as a day of joy and festivity. The day of Ashura, according to Eighth Shia Imam, Ali al-Rida, must be observed as a day of inactivity, sorrow and total disregard of worldly cares. Some of the events associated with Ashura are held in special congregation halls known as “Imambargah” and Hussainia. 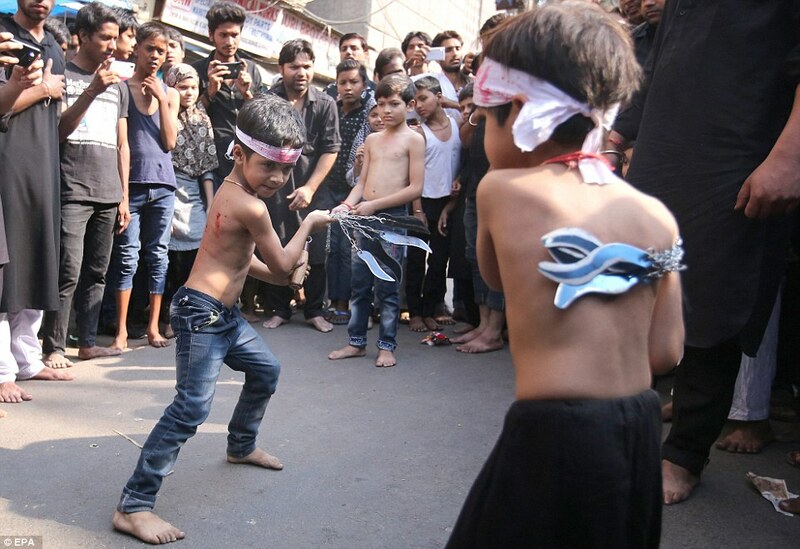 Suffering and cutting the body with knives or chains (matam) was banned by the Shi’a Marja’ Ali Khamenei, Supreme Leader of Iran and Hezbollah in Lebanon but still is practiced in Bangladesh and India. Other marjas like Mohammad al-Husayni al-Shirazi promote hemic flagellation rituals as a way of preserving the revolution of Imam al-Husayn. 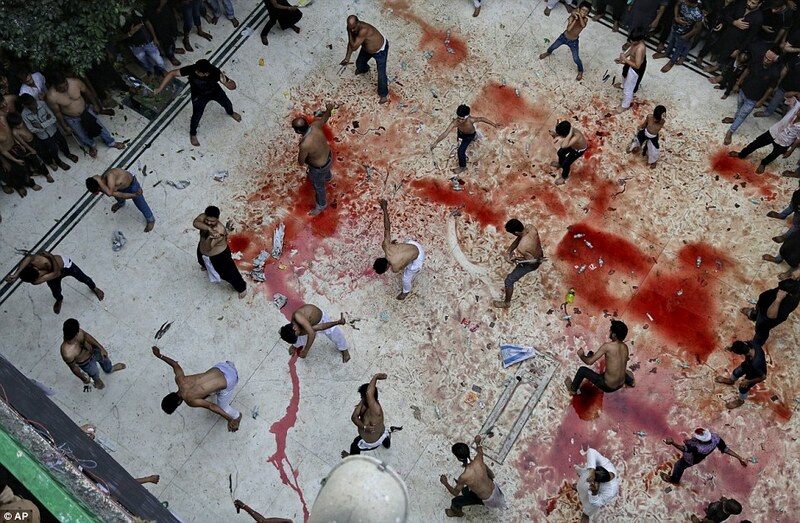 On Ashura, some Shi’a observe mourning with blood donation which is called “Qame Zani” and flailing. For Shi’as, commemoration of Ashura is not a festival, but rather a sad event, while Sunni Muslims view it as a victory God gave to Moses. This victory is the very reason, as Sunni Muslims believe, Muhammad mentioned when recommending fasting on this day. For Shi’as, it is a period of intense grief and mourning. Mourners congregate at a Mosque for sorrowful, poetic recitations such as marsiya, noha, latmiya and soaz performed in memory of the martyrdom of Husayn, lamenting and grieving to the tune of beating drums and chants of “Ya Hussain.” Also Ulamas give sermons with themes of Husayn’s personality and position in Islam, and the history of his uprising. The Sheikh of the mosque retells the Battle of Karbala to allow the listeners to relive the pain and sorrow endured by Husayn and his family. In Arab countries like Iraq and Lebanon they read Maqtal Al-Husayn. In some places, such as Iran, Iraq and the Arab states of the Persian Gulf, Ta’zieh, passion plays, are also performed reenacting the Battle of Karbala and the suffering and martyrdom of Husayn at the hands of Yazid. Indian Shia Muslims take out a Ta’ziya procession on day of Ashura in Barabanki, India, Jan, 2009. For the duration of the remembrance, it is customary for mosques and some people to provide free meals (NAZRI) on certain nights of the month to all people. People donate food and Middle Eastern sweets to the mosque. These meals are viewed as being special and holy, as they have been consecrated in the name of Husayn, and thus partaking of them is considered an act of communion with God, Hussain, and humanity. Shia Muslims take out an Al’am procession on day of Ashura in Barabanki, India, Jan, 2009. Today in Indonesia, the event is known as Tabuik (Minangkabau language) or Tabut (Indonesian). Tabuik is the local manifestation of the Shi’a Muslim Mourning of Muharram among the Minangkabau people in the coastal regions of West Sumatra, particularly in the city of Pariaman. The re-enactment includes the Battle of Karbala, and the playing of tassa and dhol drums. In Iran, people perform their Imam’s funeral by carrying a huge wooden structure called “Nakhl”, which is usually carried by several hundred men. In countries like Turkey, there is the custom of eating Noah’s Pudding (Ashure) as this day in Turkish is known as Aşure. In Trinidad and Tobago and Jamaica all ethnic and religious communities participate in this event, locally known as “Hosay” or “Hussay”, from “Husayn”. Not related to Ashura and Karbala, some Sunni Muslims fast on this day of Ashura based on narrations attributed to Muhammad. Some other Sunnis accept Ashura as a significant day due to the martyrdom of Imam Husayn and the significance of the events at Karbala. The fasting is to commemorate the day when Moses and his followers were saved from Pharaoh by Allah by creating a path in the Red Sea. According to Muslim tradition, the Jews used to fast on the tenth day. According to Sunni Muslim tradition, Ibn Abbas narrates that Muhammad came to Medina and saw the Jews fasting on the tenth day of Muharram. He asked, “What is this?” They said, “This is a good day, this is the day when Allah saved the Children of Israel from their enemy and Musa (Moses) fasted on this day.” He said, “We are closer to Musa than you.” So he fasted on the day and told the people to fast. In some countries other religious communities commemorate this event. According to Hadith record in Sahih Bukhari, Ashura was already known as a commemorative day during which some Makkah residents used to observe customary fasting. Muhammad used to fast on the day of Ashura, 10th Muharram, in Makkah. When fasting the month of Ramadan became obligatory, the fast of Ashura was made non compulsory. This has been narrated by Ayesha RA, Sahih Muslim, (Hadith-2499). In hijrah event when Muhammad led his followers to Madina, he found the Jews of that area likewise observing fasts on the day of Ashura. At this, Muhammad affirmed the Islamic claim to the fast, and from then the Muslims have fasted on combinations of two or three consecutive days including the 10th of Muharram (e.g. 9th and 10th or 10th and 11th). A companion of Muhammad, Ibn Abbas reports Muhammad went to Madina and found the Jews fasting on the tenth of Muharram. Muhammad inquired of them, “What is the significance of this day on which you fast?” They replied, “This is a good day, the day on which God rescued the children of Israel from their enemy. So, Moses fasted this day.” Muhammad said, “We have more claim over Moses than you.” Muhammad then fasted on that day and ordered Muslims too. The narrations of Muhammad mentioning the Children of Israel being saved from Pharaoh are indeed confirmed by authentic hadith in Sahih Bukhari and Sahih Muslim. ‘Ashura’ (i.e. the tenth day of Muharram) was a day on which the tribe of Quraish used to fast in the pre-lslamic period of ignorance. The Prophet also used to fast on this day. So when he migrated to Madina, he fasted on it and ordered (the Muslims) to fast on it. When the fasting of Ramadan was enjoined, it became optional for the people to fast or not to fast on the day of Ashura. Egyptian Muslims customarily eat a pudding (also known as Ashura) after dinner on the Day of Ashura. Similar to the Turkish Aşure, it is a wheat pudding with nuts, raisins, and rose water. Commemoration of Ashura has great socio-political value for the Shi’a, who have been a minority throughout their history. “Al-Amd” asserts that the Shi’a transference of Al-Husayn and Karbala ‘ from the framework of history to the domain of ideology and everlasting legend reflects their marginal and dissenting status in Arab-Islamic society. [original research?] According to the prevailing conditions at the time of the commemoration, such reminiscences may become a framework for implicit dissent or explicit protest. It was, for instance, used during the Islamic Revolution of Iran, the Lebanese Civil War, the Lebanese resistance against the Israeli military presence and in the 1990s Uprising in Bahrain. Sometimes the `Ashura’ commemorations associate the memory of Al-Husayn’s martyrdom with the conditions of Islam and Muslims in reference to Husayn’s famous quote on the day of Ashura: “Every day is Ashura, every land is Karbala”. From the period of the Iranian Constitutional Revolution (1905–1911) onward, mourning gatherings increasingly assumed a political aspect. Following an old established tradition, preachers compared the oppressors of the time with Imam Hosayn’s enemies, the umayyads. The political function of commemoration was very marked in the years leading up to the Islamic Revolution of 1978–79, as well as during the revolution itself. In addition, the implicit self-identification of the Muslim revolutionaries with Imam Hosayn led to a blossoming of the cult of the martyr, expressed most vividly, perhaps, in the vast cemetery of Behesht-e Zahra, to the south of Tehran, where the martyrs of the revolution and the war against Iraq are buried. On the other hand, some governments have banned this commemoration. In 1930s Reza Shah forbade it in Iran. The regime of Saddam Hussein saw this as a potential threat and banned Ashura commemorations for many years. 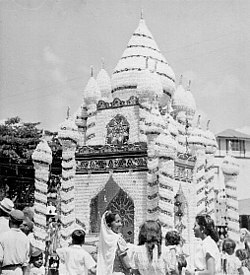 In the 1884 Hosay massacre, 22 people were killed in Trinidad and Tobago when civilians attempted to carry out the Ashura rites, locally known as Hosay, in defiance of the British colonial authorities. The 2004 (1425 AH) Shi’a pilgrimage to Karbala, the first since Saddam Hussein was removed from power in Iraq, was marred by bomb attacks, which killed and wounded hundreds despite tight security. 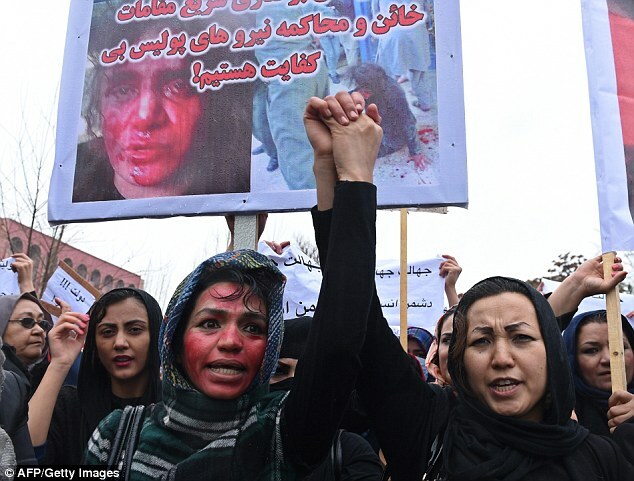 On December 6, 2011, a suicide attack killed 63 people and critically wounded 160 at a shrine in Kabul, Afghanistan where a crowd of hundreds had gathered for the day of Ashura observation.